Mine was a boy in kindergarten whom I vaguely remember, but my first home decor crush I recall quite clearly. It was early in our marriage when I developed a thing for teacups! It may have had something to do with our travels to the Cotswolds but as likely as not, it was also something I could collect that was easily affordable. Long before we had the money to buy furniture for our home, I began collecting teacups in my travels overseas or on weekend forays to local antique markets. They could be carried back on an airplane if necessary and gave me purpose when scouring the vintage shops nearby. But displaying them became a bit of a challenge, since much of this collecting took place before we had furniture. 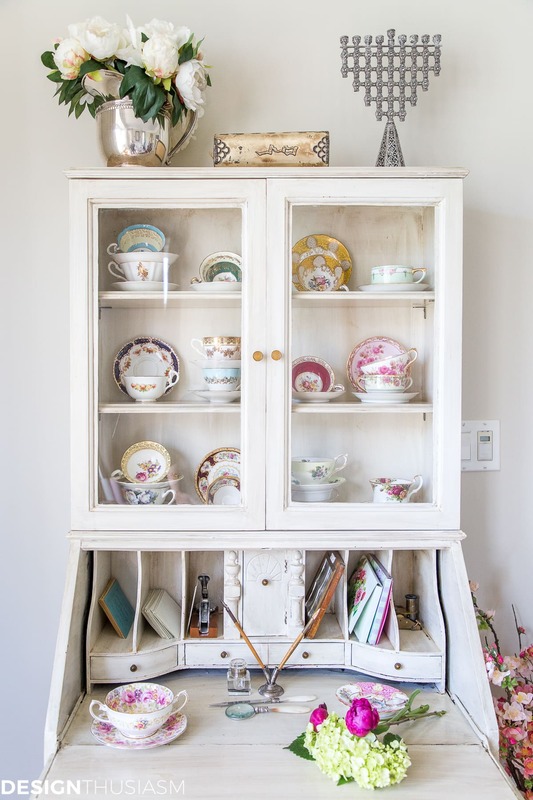 The obvious choice for showcasing tea cups you’ve collected is in a china cabinet or hutch near your dining room table. 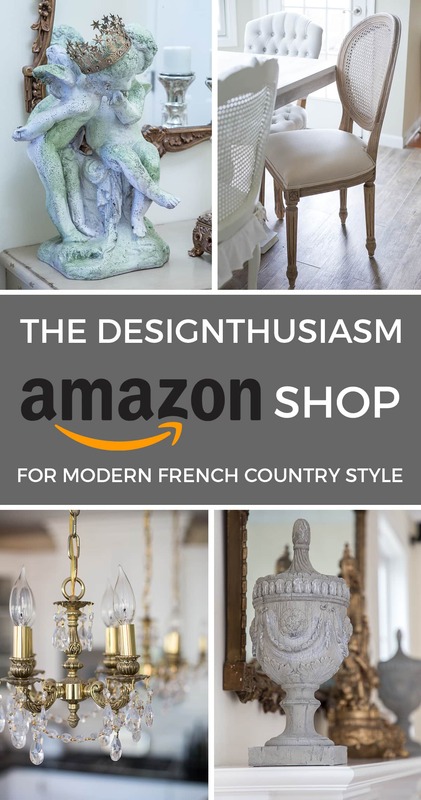 But if your china cabinet is too large or if you haven’t got one at all, you might try styling them in a small secretary desk. I love collecting mix and match pieces in similar colors but completely different patterns. I enjoy the way they look when grouped together but I take some liberties in organizing the presentation. Some are double stacked, while others show the saucer standing and facing out. Still others are nested in a casual heap and some show the tea cup tilted to expose the bottom flourish. The key is to have fun when grouping them in this way. If like me, you haven’t finished furnishing but you’d like to display your collection, another great option is to gather the items in a large basket. 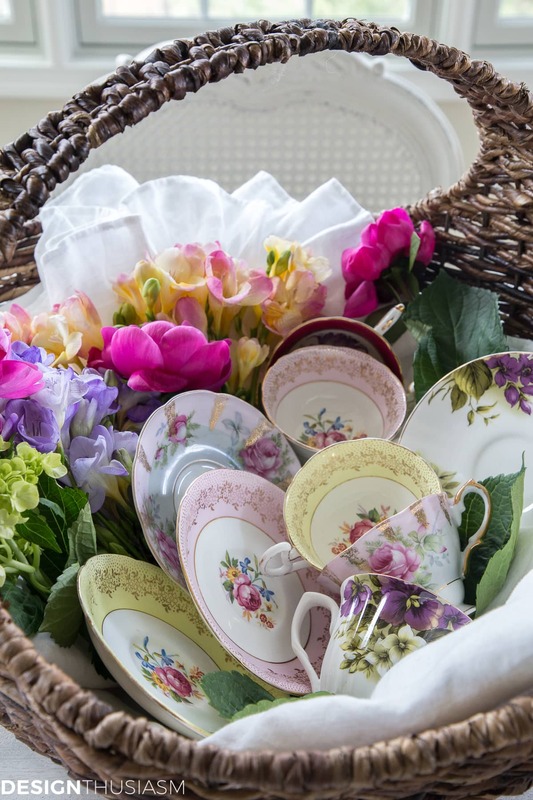 Line the bottom with a pretty linen tablecloth and layer in your teacups and saucers too. Pay attention to the color distribution and use patterns that complement each other. 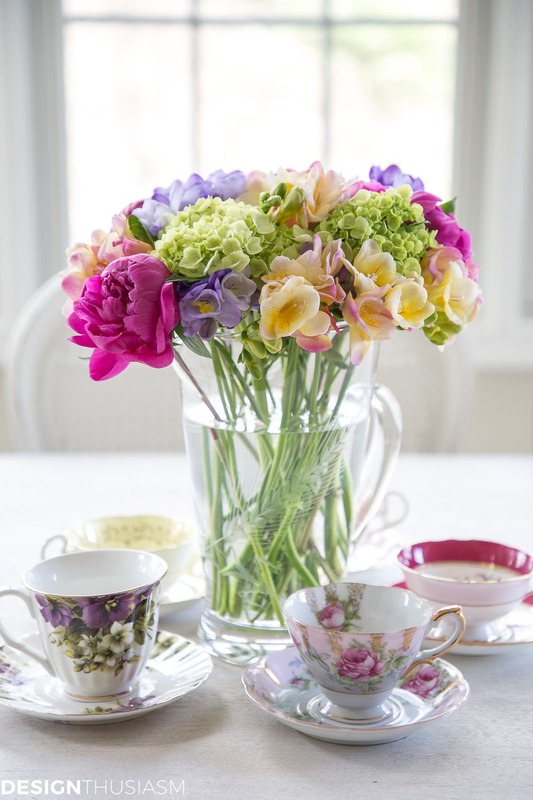 I tend to favor English florals or delicate French china patterns, so the colors are soft and feminine. 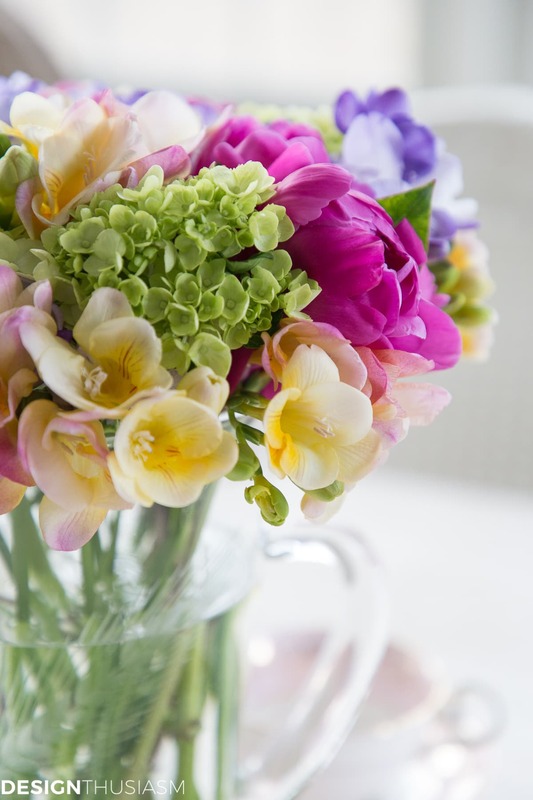 You can tuck in fresh flowers or even use faux, and place your arrangement on a table or counter. Perhaps the most unique way I’ve displayed my teacups is attached to a vintage crystal chandelier that once belonged to my grandmother. I tell the whole story of its provenance in ONE OF MY FIRST POSTS, but the short version is that I had my teacups and other trinkets wired to the chandelier. It’s a wonderful conversation piece that always sparks lively banter and it has been with us since long before we had the large hutch that houses most of my china now. These days it hangs in our butler’s pantry and is absolutely perfect for the space. A display idea I love is using three dimensional wall hangings in addition to art and placing teacups on shelves and sconces is a creative way to feature them. In OUR FRENCH COUNTRY LIBRARY I have two gilded sconces with a mirror between them and I keep pretty cups on the tiny sconce shelves. 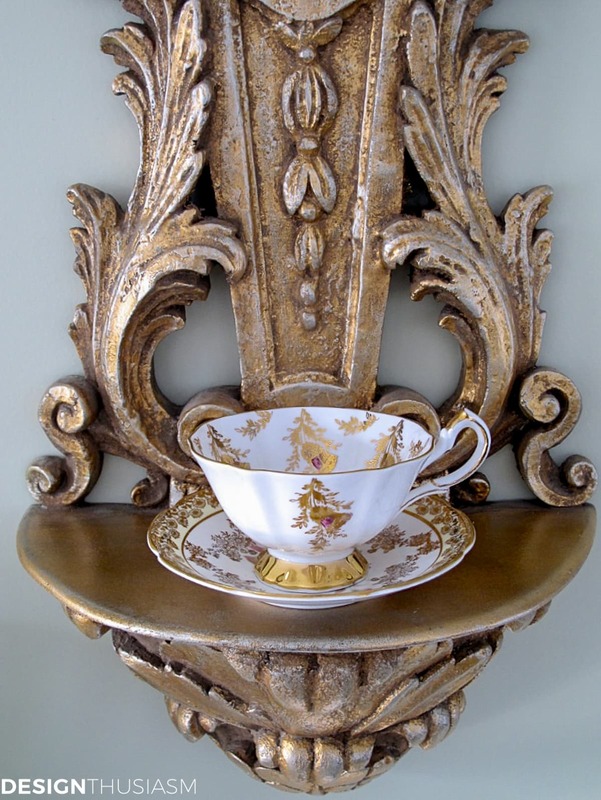 I use tea cups with gold trim to work with the gilt sconces and they make a lovely perch for my most precious teacups. I also like to use my teacups for what they were actually meant for. 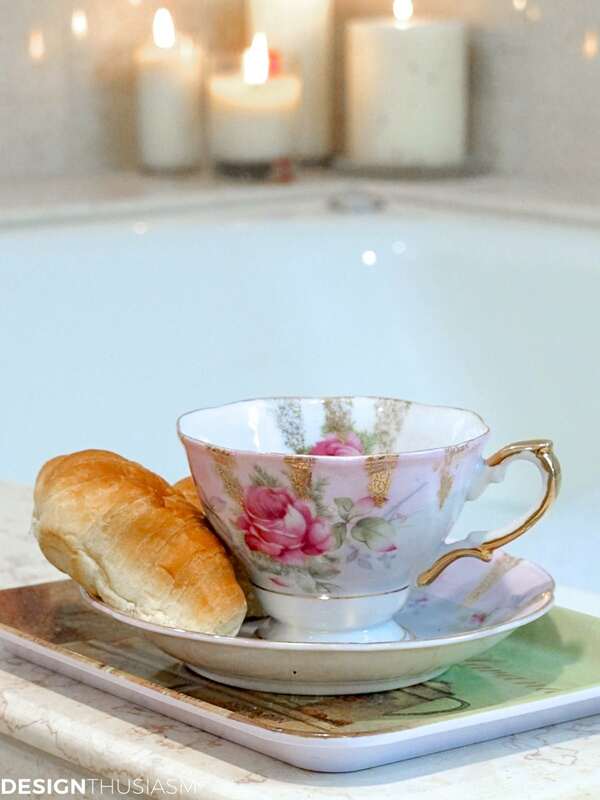 A relaxing soak in the tub is an excellent time for a cup of tea. You can see more of my earlier MASTER BATH ADD-ON or take a peek at our newest bath renovation in this MASTER BATHROOM REVEAL. In both cases you’ll notice a teacup by the tub (and I really use it!) This one also happens to be my very favorite cup. Sometimes I display not only teacups, but also books about taking tea. The ritual is a delightful one and these books are often as pretty as the porcelain itself. 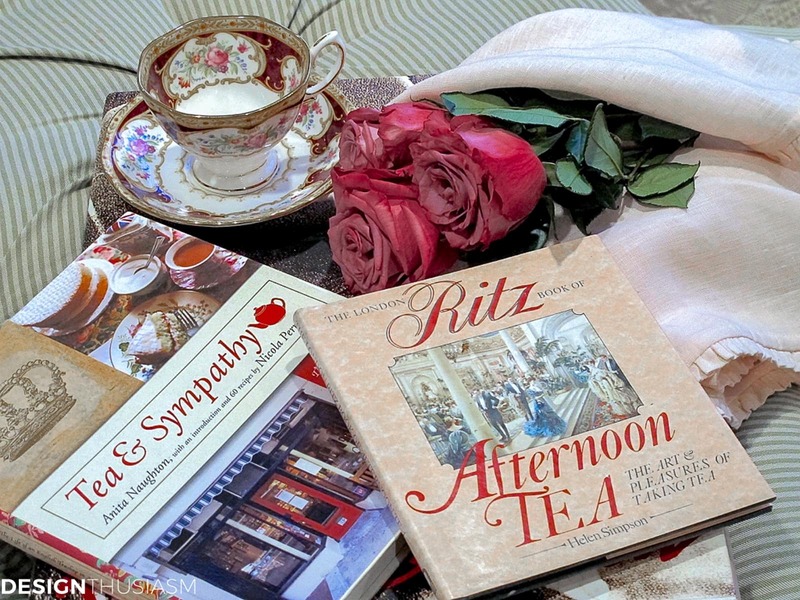 Two of my favorites are The London Ritz Book of Afternoon Tea and Tea and Sympathy. On a plate stand at the foot of the sofa I’ve added teacups in varied china patterns. The gentle florals work well with my color palette and the mix with varied cake plates adds another touch of interest. The top two are actually soup bowls, but they maintain the same spirit. The plate stand can be positioned in so many different places, from decorating a sideboard to embellishing a small table, although I do favor keeping it on the floor. And finally, if your collection is not as developed as you like, or you simply can’t get enough, find artwork that celebrates the imagery of teacups. 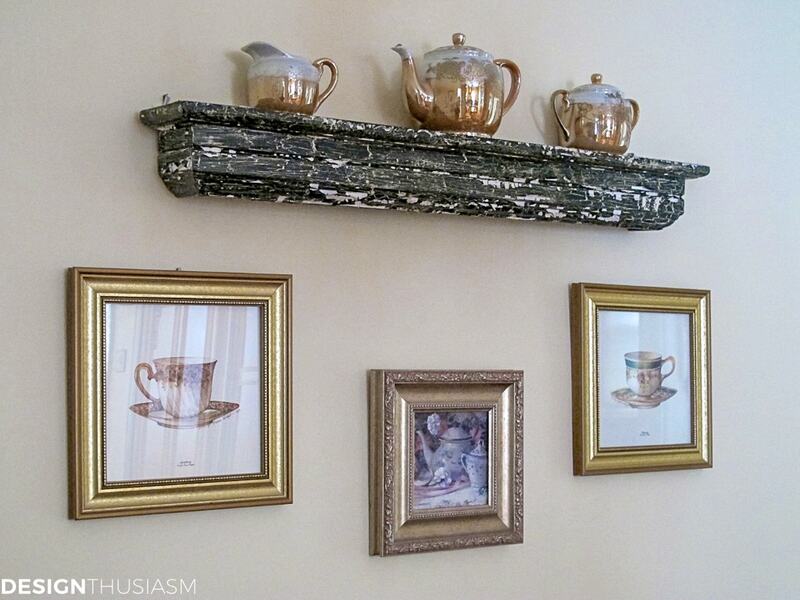 Here I mix the paintings with a sugar bowl and creamer set on a chippy shelf in my kitchen. There is just something about teacups that I find so charming. They suggest a real gentility that is so appealing and often they are simply quite beautiful. Just as a crush should be! WOW, Lory! You have come up with some really unique ways to enjoy your teacups on a daily basis! Beautiful!!! The teacup chandelier is the most unique of all, and I’m sure it has sparked not only conversation but creativity in those who have seen it. I’ll bet they head straight home and wonder how they could do something with items they have that are treasured and need to be artfully displayed! 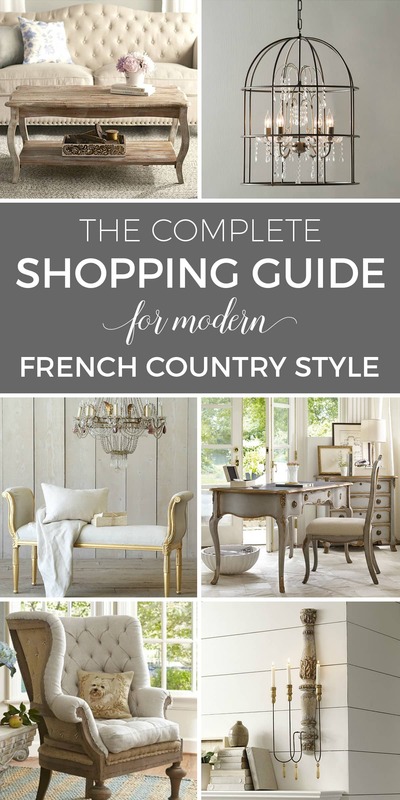 I know that looking at your vignettes has given rise to my inner decorator!!! You have a lot of really gorgeous teacups and saucers that would make taking tea a super pleasure! Oh, boy! Do I have cups! I am trying to downsize my belongings from a two-bedroom, bath-and-a-half, two-story townhouse into a one-bedroom apartment and am having a time figuring out what to do with all of them. I’ve tried to sell some through a consignment store and have been told they don’t sell in Boulder, Colorado, especially those with gold on them! Can you believe it? I have, I believe, eight of the pattern in your photo with the books, but mine are navy blue. In the market? You have, though, given me one more idea for display…stacking them on plates on my plate stands. I’m already using every last one of the wonderful and beautiful ideas you have provided. Thanks. Enjoyed this immensely. I can’t tell you how much I loved your comment! To write a post and find out it really resonates with someone is really gratifying. If you really want to sell, you should consider selling online. I’d love to look at what you have… 🙂 Thanks so much for taking the time to comment! 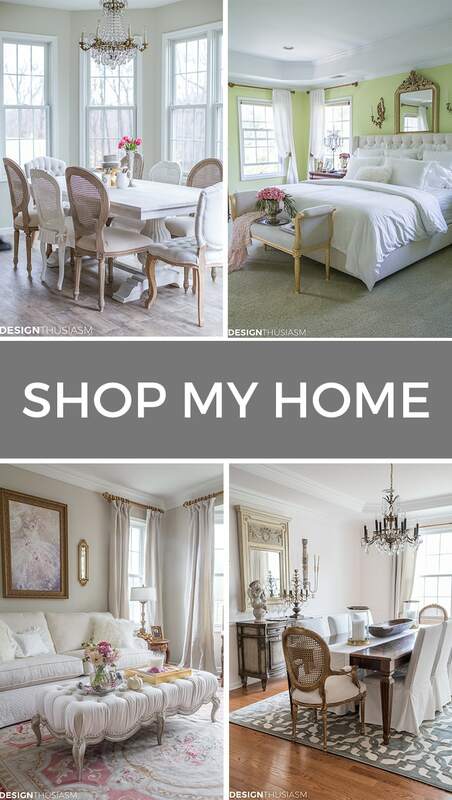 I’m interested in seeing what you have to consider purchasing. Could you please email photos? Oh, I love the tea books, and I adore your teacups. Great, and thanks so much, Lisa! Yes, I noticed our similar tastes when I perused your page… 🙂 So glad you messaged me to link up! Your tea cup decor is quite lovely. I love the way you use your tea cups in your decorating. 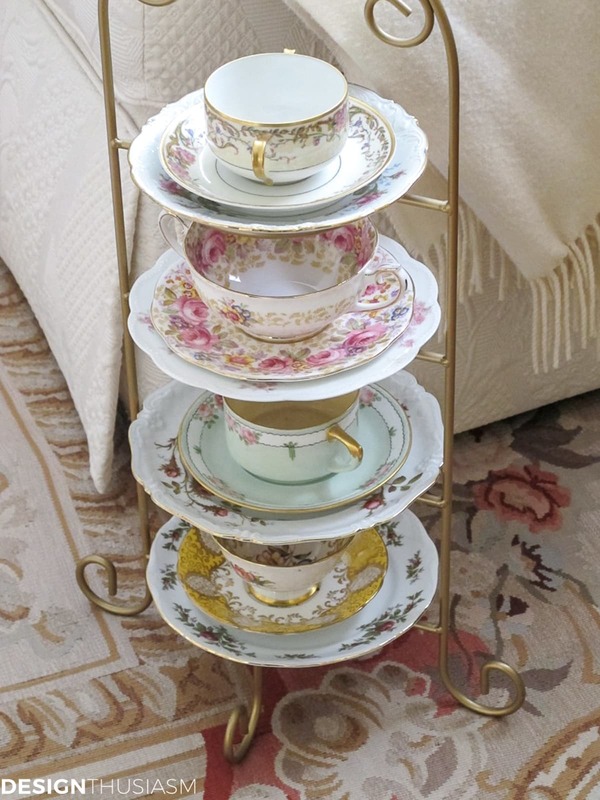 I have so many tea cups and I found a wonderful way to display them. A thrift store was selling a gun cabinet – yes, you read it right – a gun cabinet. But no one uses gun cabinets anymore because if you are a hunter and own guns, you lock them up. Well the cabinet dropped down to half price and I bought it. My husband fitted the inside of the cabinet with shelves. The cabinet is quite shallow and a cups and saucers fit perfectly inside. I love it! Thanks, Patti! And what an interesting (and much better) use of your cabinet… 😉 I’d much rather look at pretty teacups any day! Thanks for sharing on Something To Talk About Link Party!! Please stop by again next Monday! So beautiful! I am going to try some of these ideas! Thanks, Ellie! Take pics if you try some… 🙂 Would love to see them, as we clearly have the same taste! Lory, thank you again for linking up your beautiful eye candy and we’d love for you to link up again tomorrow (Monday) morning at 6 am est to our Something to Talk About Link Party. Hope you had a great weekend, Lisa at Concord Cottage. i love tea cups so my cousin made me a “tea tree” in my dining room. 8′ christmas tree decorated with old and new tea cups, saucers, tea pitchers, cups and saucers glued together and decorated with ribbon and pearls. bows and lace on tree also. it is beautiful almost ready to put up another one. i have collected old family heirlooms also and put them up. Thank you so much! You display idea sounds wonderful… 🙂 And wow, 213 cups!! Well done! I do love to see other people’s collections too. Thanks for visiting! Lory, so many wonderful ideals. 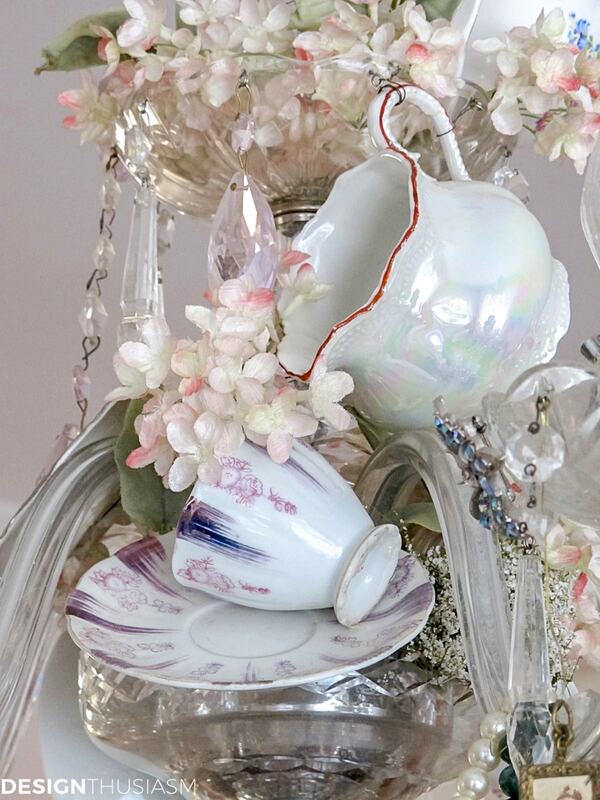 I loved the teacup chandelier, that would be such a cute ideal for the garden as well. I have quiet a few teacups and I think you have motivated me to pull them out of the china cabinet and display them. I live in an old house with lots of dark wood and I have never thought how beautiful they looked against dark wood. Again thanks for the inspiration. 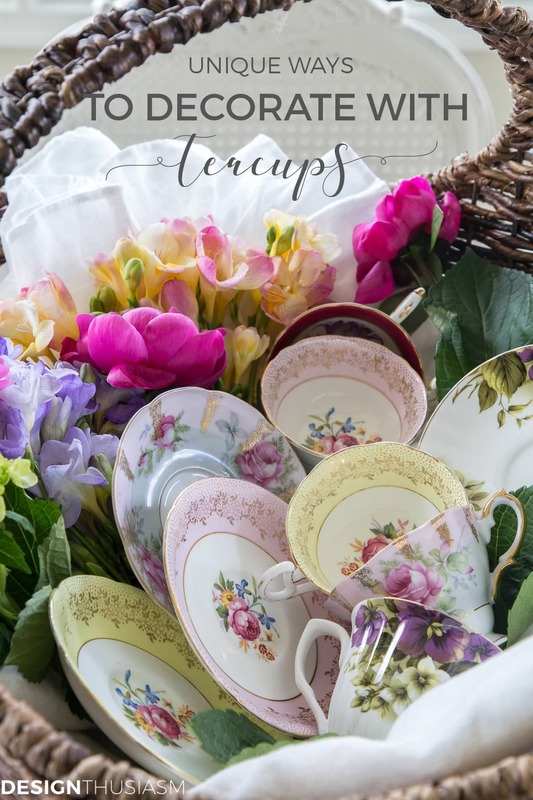 A lovely post on teacups Lory! I always admire them, but I don’t have very many myself. I’m interested in seeing the post on the chandelier, but I couldn’t find it. Anyway, you have a lovely style. Thank you for your sweet comment, Marilyn! Even a small grouping looks lovely. What beautiful photos in your e-book!